The land transportation corridors linking Asia and Europe are on the verge of re-awakening following centuries of neglect. Silk Road, one of the greatest sagas of human endeavor is being revived in the view of the fast changing world order. The regional neighbors and strategic partners - Azerbaijan, Georgia and Turkey - took this responsibility on their ‘shoulders’ by establishing the Baku-Tbilisi-Kars railway road, which is going to play a key role in helping to revive the Silk Road connection with the regional countries of Eurasia and Europe. The Baku-Tbilisi-Kars railroad, the ‘iron ground’ for the Silk Road targets to stimulate the development of non-oil economy and economic activities in the region restoring the historical position of the region as a commercial hub along the ancient silk ways. At a time when civilization needs a more peaceful approach and dynamical growth opportunities, restoration of the Great Silk Road in new ampoule makes the project even more actual. The BTK regional rail link, which will connect Kars in Northeast Turkey to the Georgian capital of Tbilisi and Baku, Azerbaijan’s capital city, is aimed to increase the flow of both passenger and freight traffic amongst all three participating nations, plus increase political and economic cooperation between them. The commissioning of the over 800-kilometer railway line will allow the regular transportation of goods from Turkey and Europe to the countries of Central Asia and China, and also to the south -- to Iran, the Persian Gulf countries, Pakistan and India. The railway, construction of which began in 2008 expected to be commissioned on October 28, earlier said Head of Azerbaijan Railways Javid Gurbanov, who together with officials from Turkey and Georgia reviewed the implementation of the project on September 27. Gurbanov together with Mamuka Bakhtadze, Director General and Chairman of the board of directors at the Georgian Railways and Ahmet Arslan, Turkish Minister of Transport, Maritime and Communications traveled by train from Tbilisi to Akhalkalaki, visited Tsalka, Tetritskaro and other stations, as well as reviewed whether the railway, which would connect Asia and Europe, is ready for operation. "We have tested the new Baku-Tbilisi-Kars railway,” Gurbanov told media. “The railway is ready for operation. 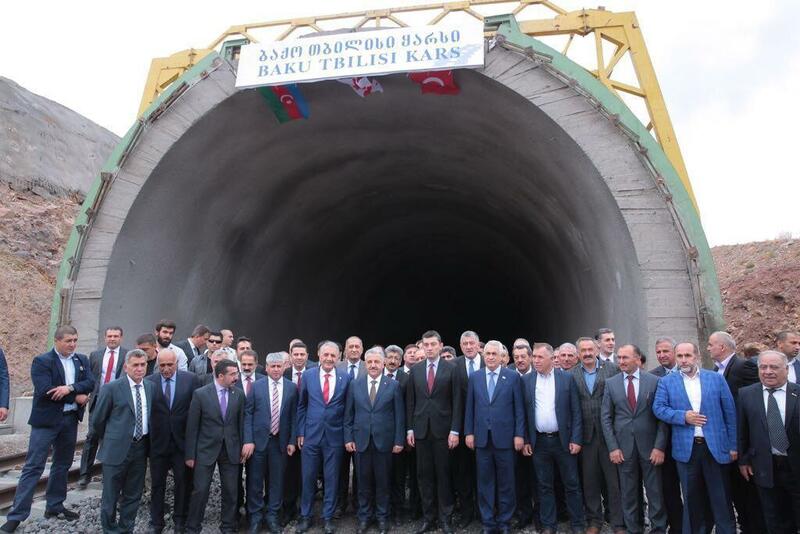 After the official opening ceremony with the president’s participation, the Baku-Tbilisi-Kars railway will be commissioned." Besides the heads of the transport structures of the three countries, Georgian Minister of Economy and Sustainable Development Giorgi Gakharia, Chairman of the Azerbaijan Caspian Shipping Company Rauf Valiyev, Ambassador of Azerbaijan to Georgia Dursun Hasanov, Ambassador of Turkey to Georgia Zeki Levent Gumrukcu and other officials also attended the event. BTK will be a further rail route between Turkey and the Caspian Sea, on which Baku sits, allowing goods and people to move around Central Asia, the Middle East, and Europe. As the commissioning of the approaches, meetings at various political levels with the signing of documents in the transport sector intensified. Gakharia said that the railway has already received an offer on shipping containers from Kazakhstan to Turkey. The first freight train will be dispatched by Baku-Tbilisi-Kars railway in two months, according to Bakhtadze. Meanwhile, the first test train on the Baku-Tbilisi-Kars route left Turkey for Georgia on July 20. As part of the Baku-Tbilisi-Kars railway, Turkey is also constructing its logistics center that currently is being built in Kars. With the project cost estimated at $26.6 million is expected to be commissioned in October 2018. The peak capacity of the remarkable project that should link Turkey more tightly to Central Asia will be 17 million tons of cargo per year. At the initial stage, this figure will be one million passengers and 6.5 million tons of cargo. Cargoes are likely to be mostly oil or petroleum products, as the Caspian Sea region is one of the world’s most fertile oil producing regions. Additionally, most of Turkey’s freight traffic to former CIS countries will likely shift to the BTK route initially, suggesting it will become a vital economic lifeline for all countries involved. Passenger loads are also anticipated to increase hugely. By 2037, passenger traffic is forecast to top out at three million passengers a year and this can stimulate tourism in the host countries. As the train can carry a large number of tourists and provide them with the opportunity to visit more different places, rail tourism is very profitable for regional states, including Azerbaijan. The republic also considers the possibility to prepare joint routes to attract tourists from the countries located along the "Silk Road", including China, Kazakhstan, Uzbekistan, Kyrgyzstan, Turkey and Iran.